About two hours into the loud and lively service at Trinity Grace Church, it was time for me to preach the sermon. Due to the lengthy of the proceedings, I inflicted upon the congregants only a very short homily on the prophet Jonah. A year ago, when I first visited the church, the congregation was about 20% smaller. Thanks to the addition of the kids from our Kalimpong 2 home, the already-cramped church is now packed to beyond what I would consider capacity. When Kalimpong 3 comes online, they will either have to stack the kids like firewood or find a bigger space. After church we walked about half a mile down to a small municipal playground for a few hours of rough-and-tumble fun and a very simple picnic lunch of jam sandwiches and cookies. It’s amazing to see the kids playing together, helping each other and just soaking in the benefits of a real, loving family. There’s a clear difference between the two homes. The kids from Kalimpong 1 are older, more confident, better adjusted and more completely individuated than those at KP2. The new kids are smaller, less-well nourished and a lot squirrelier. It’s hard to tell them apart from each other, as they all share a certain shell shock that I’ve seen many times before in Cambodia and Thailand, and that will fade over the next few months as they settle in. 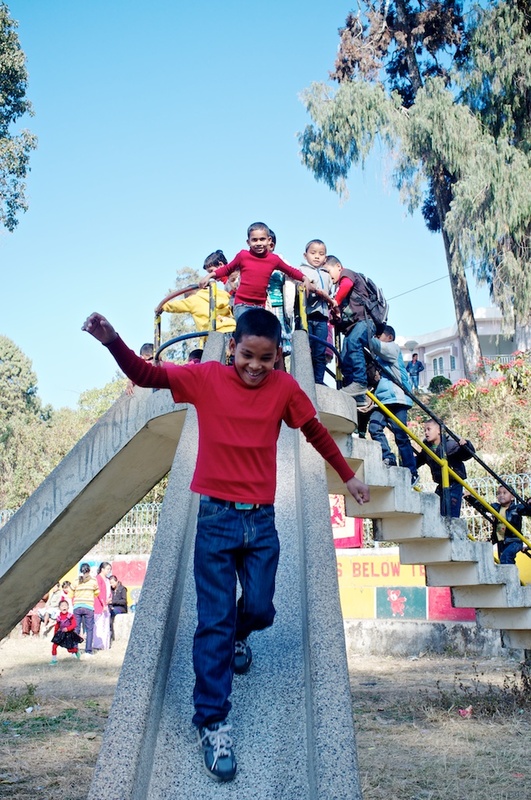 Watching the newest kids – especially the “provisional” ones who will eventually call Kalimpong 3 home – you can get a bit of a sense of the struggle these children had and the poverty and hunger they experienced until very recently. When it’s time to play, they don’t really know what to do. But when it’s time to eat, they pack it away like it’s their last meal on the planet. Up to a few weeks ago, a good meal never came with a promise for more tonight, tomorrow and the next day. 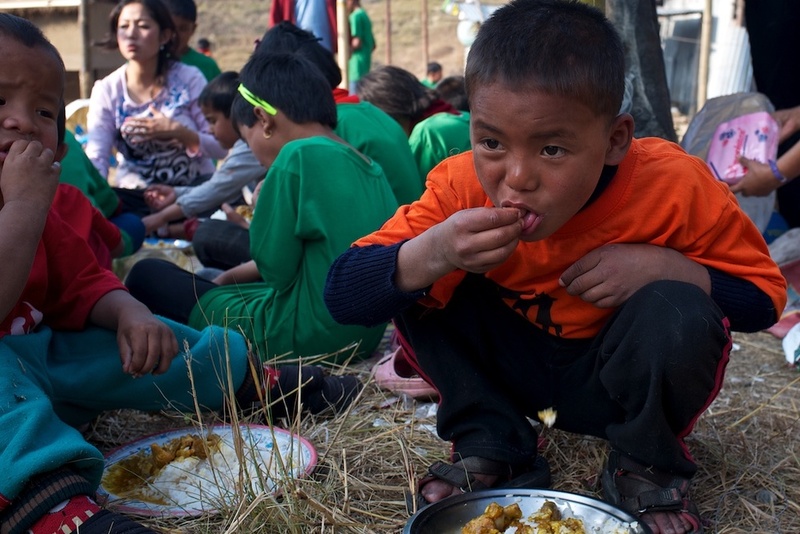 The Kalimpong 2 kids know how to put away the food. This morning we packed the kids into a bus and drove down the mountain into the valley, where we had been promised a river-side field trip and picnic. Technically, we were at a river, but the entire site was a construction zone. There were no picnic tables, but there were huge, garishly decorated trucks rumbling in empty and out with loads of rocks. There was also a lot of heavy construction equipment – excavators, bulldozers, rock crushers. Not exactly the most serene setting for picnic, but we made do. There was a large swimming pool, but it was empty. No problem, though, as many of the kids used it for Simon Says and Red-Light-Green-Light. A beautiful, but rugged picnic site. The staff set up a mobile kitchen and began cooking a delicious meal over campfires, and a bunch of the kids headed down to the river to swim. All of the kids below the age of five stripped down to their birthday suits and jumped right in. We all concluded quickly that this was better left un-photographed, and we left the kids to their skinny dipping. We spent the better part of the day with the kids, which is good. Tomorrow we’re leaving for three days to visit other parts of the country and another undisclosed location, and I’m going to miss all of them terribly. I have lots of good pictures, but not lots of good internet, so the photos will have to wait. Please pray for our safety and health as we continue to do our best to encourage the kids and staff of Asia’s Hope and our brothers and sisters in North India and beyond. Victory Prayer Church and Social Welfare Society. And mountains.